Avatar Grace Augustine comes dressed in tan jungle fatigues, very reminiscent of modern day hiker attire, complete with ankle high boots, mid-thigh khakis and a bared midriff (thanks to a strategically tied shirt). The uniform is correctly sculpted and it shows natural-looking folds and creases in all the right places, although there are no sculpted fabric textures in it. Like the RDA version of Jake Sully’s Avatar, the boots have the more intricate sculpting, looking rather comfortable and sports-like, complete with textured soles. Grace is a completely unique sculpt, and her face has an uncanny resemblance to the CGI model used in the film, which is also eerily close to Sigourney Weaver face. • Ball jointed neck. This works as a simple swivel because the ball rests too deep inside the head, but it rotates freely despite the queue and the bandanna on Grace’s forehead. • Peg & hinge elbows. These bend to 90°and have full sideways rotation. • Swivel waist. It affords about 90° swivel arc due to the bulky pouch glued at the back of the utility belt. • Hinged ankles. Excellent movement up and down. The joint is placed rather high, which looks odd at times. 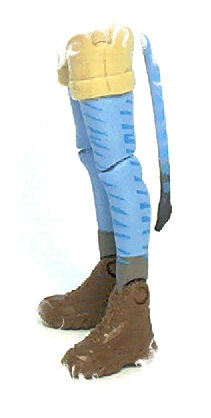 Avatar Grace Augustine is molded mostly in tan plastic, with just the tail, forearms and head being molded in blue. 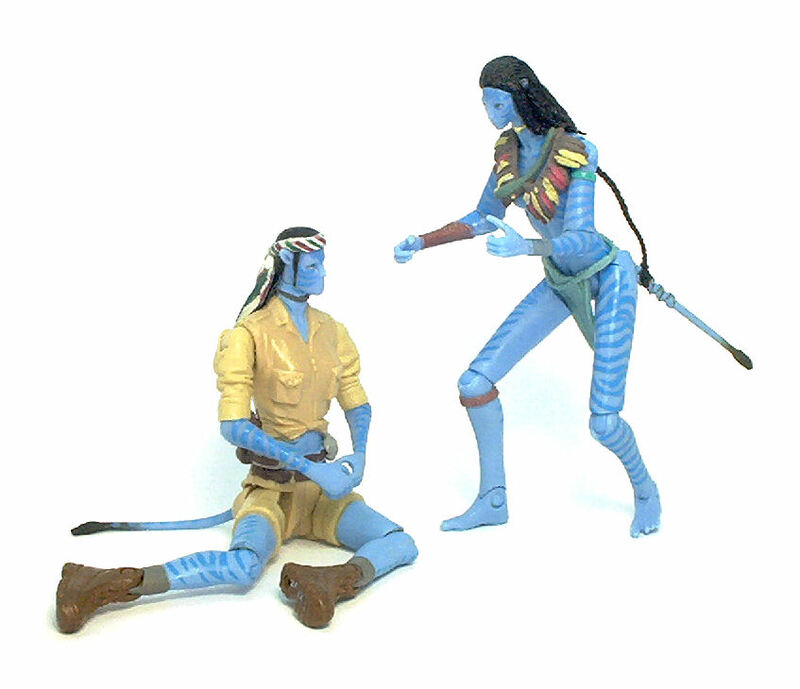 The other sections of exposed skin are painted in a hue that does a good job matching that of face and forearms, with the deeper blue markings characteristic to the Na’vitying all up together. Grace’s hair is painted gloss black and the eyes display a very proficient two-color paint application that includes catch lights in the pupils. 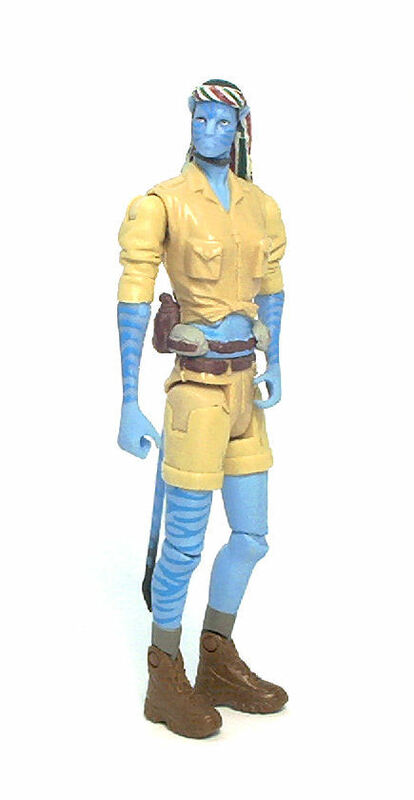 The tan clothes have no paint on them whatsoever, although some extra touches of color come from the shoes, utility belt and especially from the tri-colored headband she wears. The paint operations are all clean and sharp, even the mistakenly applied ones, like the tiger stripe pattern on the left leg on my figure. It seems that normally, the area uses at least two painting masks to transfer the pattern onto the limb, but on my figure it seems it was used only one mask, twice, and applied upside down. The effect is not immediately evident, but once you notice it it’s hard not to think about it. I suppose I could fix it, but right now I just don’t feel like breaking out the paint pots and brushes to do so. Avatar Grace Augustine comes equipped with a futuristic machete; a flat, pointless blade with triangular patterns molded lengthwise in it. The tool is molded in gray, with the handle painted dark green. Grace also comes with the corresponding iTag base plate. 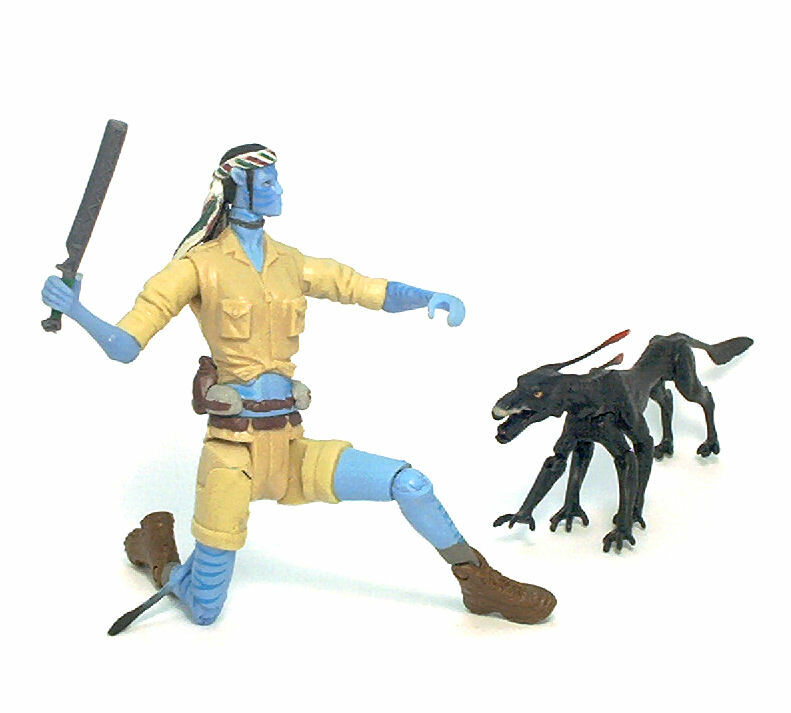 The iTag plate for this figure follows the Na’vi carving design and is molded out of translucent amber-colored plastic. 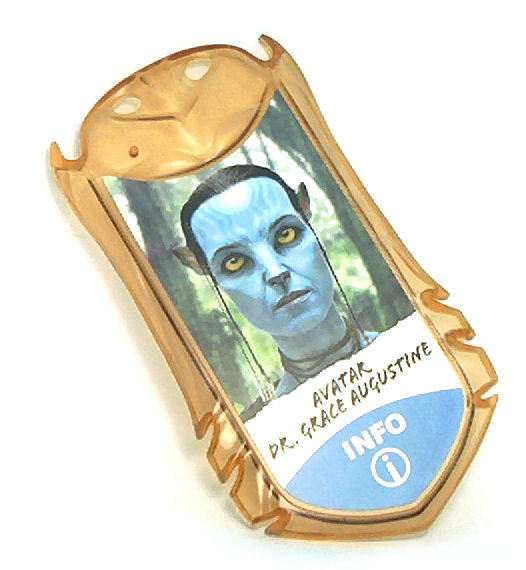 The iTag base has a sticker on top with a portrait of Grace Augustine in her Avatar form and logging on to Mattel’s Avatar website it generates a CGI model of one of the key locations in the film, the Tree of Souls. This CG model doesn’t have animation built in, but it does contain some looped jungle sound bites. 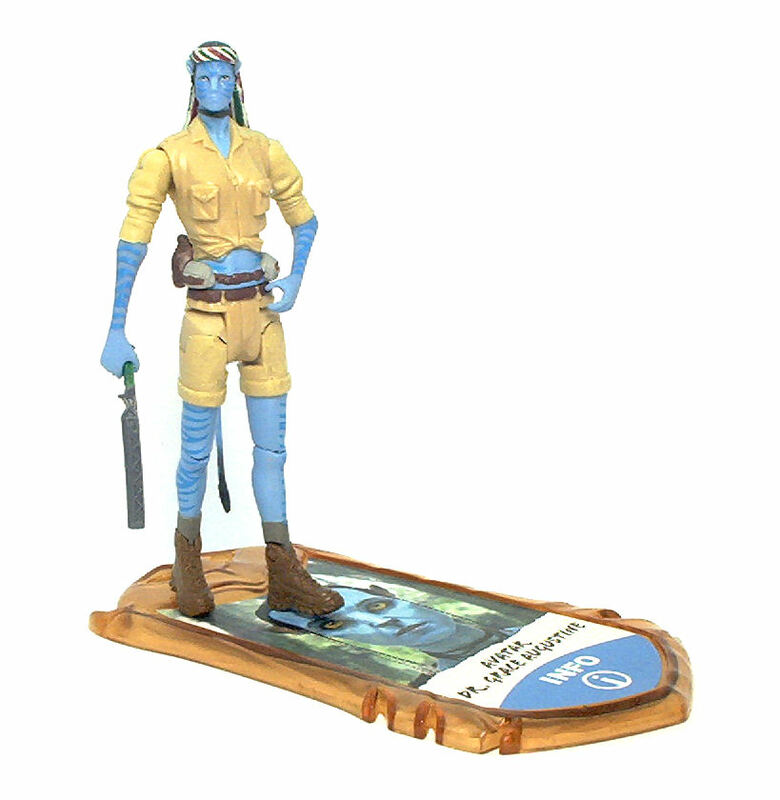 Overall, Avatar Grace Augustine is a fairly decent action figure. This Mattel line, as a whole, definitely lacks the level of detail Hasbro achieves in this scale, but it does manage an amount of inner consistency that appeals to me on a very basic level.